Explicit template specialisation of the Gauss Seidel method for compressed row format matrices. Definition at line 790 of file iterative_linear_solver.h. Definition at line 795 of file iterative_linear_solver.h. Definition at line 800 of file iterative_linear_solver.h. Definition at line 806 of file iterative_linear_solver.h. Definition at line 969 of file iterative_linear_solver.h. Definition at line 831 of file iterative_linear_solver.h. Definition at line 955 of file iterative_linear_solver.h. Definition at line 812 of file iterative_linear_solver.h. Definition at line 938 of file iterative_linear_solver.h. Definition at line 915 of file iterative_linear_solver.h. Generic setup function to sort out everything that needs to be set up with regards to the input matrix. Explicit template specialisation of the smoother_setup function for CR matrices. Set up the smoother for the matrix specified by the pointer. 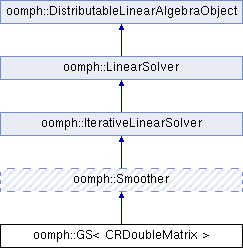 This definition of the smoother_setup has the added functionality that it sorts the entries in the given matrix so that the CRDoubleMatrix implementation of the solver can be used. Definition at line 1463 of file iterative_linear_solver.cc. Definition at line 838 of file iterative_linear_solver.h. Definition at line 821 of file iterative_linear_solver.h. Explicit template specialisation of the solver for CR matrices: Takes pointer to problem and returns the results vector which contains the solution of the linear system defined by the problem's fully assembled Jacobian and residual vector. Definition at line 1390 of file iterative_linear_solver.cc. References oomph::DoubleVector::build(), oomph::DistributableLinearAlgebraObject::build_distribution(), oomph::GS< MATRIX >::clean_up_memory(), oomph::Problem::communicator_pt(), oomph::DistributableLinearAlgebraObject::distribution_pt(), oomph::LinearSolver::Doc_time, oomph::LinearSolver::Enable_resolve, oomph::Problem::get_jacobian(), oomph::IterativeLinearSolver::Jacobian_setup_time, oomph::GS< MATRIX >::Matrix_can_be_deleted, oomph::GS< MATRIX >::Matrix_pt, oomph::Problem::ndof(), oomph::oomph_info, oomph::GS< MATRIX >::Resolving, oomph::GS< MATRIX >::solve_helper(), oomph::TimingHelpers::timer(), and oomph::Smoother::Use_as_smoother. Definition at line 862 of file iterative_linear_solver.h. Definition at line 905 of file iterative_linear_solver.h. Explicit template specialisation of the solve_helper function for CR matrices. Exploiting the sparsity of the given matrix allows for a much faster iterative solver. Definition at line 1508 of file iterative_linear_solver.cc. References oomph::DoubleVector::build(), oomph::CRDoubleMatrix::build(), oomph::CRDoubleMatrix::column_index(), oomph::DistributableLinearAlgebraObject::distribution_pt(), oomph::IterativeLinearSolver::Doc_convergence_history, oomph::LinearSolver::Doc_time, i, oomph::DoubleVector::initialise(), oomph::GS< MATRIX >::Iterations, oomph::IterativeLinearSolver::Max_iter, oomph::DoubleVector::norm(), oomph::DistributableLinearAlgebraObject::nrow(), oomph::oomph_info, oomph::IterativeLinearSolver::Output_file_stream, oomph::DoubleMatrixBase::residual(), oomph::CRDoubleMatrix::row_start(), oomph::IterativeLinearSolver::Solution_time, oomph::Global_string_for_annotation::string(), oomph::IterativeLinearSolver::Throw_error_after_max_iter, oomph::TimingHelpers::timer(), oomph::IterativeLinearSolver::Tolerance, oomph::Smoother::Use_as_smoother, and oomph::CRDoubleMatrix::value(). Definition at line 999 of file iterative_linear_solver.h. Definition at line 987 of file iterative_linear_solver.h. Definition at line 995 of file iterative_linear_solver.h. Definition at line 984 of file iterative_linear_solver.h. Definition at line 991 of file iterative_linear_solver.h.